Biotech companies have developed strains of mice that make antibodies, compatible with humans, that can be designed to attack proteins involved in disease. 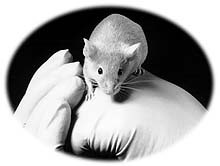 This mouse was produced by Abgenix. ichard Belmont, an airline pilot, went to the emergency room on Christmas Eve in 1989 for what he thought was a pulled abdominal muscle. It turned out to be non-Hodgkin's lymphoma, a usually incurable cancer. "I think it's your last Christmas," Mr. Belmont recalled being told by the doctor. After a single treatment, the cancer disappeared and has stayed away for the three and a half years since. "To me it's a miracle," said Mr. Belmont, 61, who lives in Long Grove, Ill.
Antibodies are the body's first line of defense, latching onto foreign proteins on the surface of bacteria or viruses. In 1975, two scientists developed a way to make highly uniform antibodies that could be aimed at a particular protein. The manufactured antibodies were called monoclonal antibodies, and scientists were immediately intrigued with the idea of using them as "magic bullets" to attack diseased cells while leaving healthy ones unscathed, thereby minimizing side effects. But numerous attempts to use antibodies as drugs failed. "It was very difficult to harness this lightning in the body," said Dr. Louis M. Weiner, chairman of medical oncology at the Fox Chase Cancer Center in Philadelphia. The long development time demonstrates that even in the fast-paced world of biotechnology, it can take decades to iron out the kinks in a powerful new tool. And that, said Viren Mehta, a pharmaceutical analyst at Mehta Partners in New York, should give pause to patients and investors who expect an immediate medical payoff from the latest big breakthrough � the sequencing of the human genome. "Antibodies have gone through sort of a birth, death and rebirth," said Dr. Samuel D. Waksal, president and chief executive of Imclone Systems Inc., a New York company that is developing antibodies. Moreover, many scientists say antibodies are poised to play an even bigger role. New techniques allow human antibodies to be made in genetically engineered mice or viruses. And having a rough map of the human genetic code is expected to result in the discovery of thousands of new genes � and the proteins they code for � that play roles in disease. That means thousands of potential new targets for antibodies. Indeed, the quickest way to turn a gene discovery into a drug is to make an antibody that binds to the protein and interferes with its function. "Now people are pulling things out of databases and they are immediately able to get a candidate therapeutic molecule," said Dr. Nils Lonberg, a scientist at Medarex Inc., an antibody company, who was referring to genome databases. Medarex, based in Princeton, N.J., recently started patient tests of an antibody 12 months after first deciding upon the protein target, far faster than the years it would take to synthesize a chemical that could bind to the protein. There are now nine approved monoclonal antibody drugs, up from only two in 1996, and they include some of the industry's most important new products � Genentech Inc.'s Herceptin for breast cancer, Genentech and Idec Pharmaceuticals Corporation's Rituxan for lymphoma, the Centocor unit of Johnson & Johnson's Remicade for Crohn's disease and rheumatoid arthritis, and MedImmune Inc.'s Synagis, which prevents a deadly lung infection in premature infants. Another is Imclone's C225 for colorectal cancer and head and neck cancer. "I have patients who respond to it after they failed to respond or stopped responding to standard treatments," said Dr. Leonard B. Saltz of Memorial Sloan-Kettering Cancer Center in Manhattan, who is leading one test of the drug. But scientists have since learned to "humanize" antibodies using genetic engineering, a technique pioneered in part by Protein Design Labs Inc. The part of the antibody that grips the target still comes from a mouse. But that part is then grafted onto the rest of a human antibody. That reduced the immune response to levels that were generally tolerable. All the antibodies approved for use as drugs in the last few years are humanized in some way. Having fully human antibodies should largely eliminate any immune response to the antibodies. "Something that's fully human or that's part mouse � which would you rather have as a patient?" said R. Scott Greer, chief executive of Abgenix. Moreover, the fully human antibodies can be made quicker than the humanized ones because they do not have to be tinkered with once they come out of the mouse. "We'll make little molecules that actually work better than antibodies," said Dr. Mark I. Greene, a professor of medicine at the University of Pennsylvania. "It's quite clear to everyone in the cancer field that there is no single agent that's going to cure," said Dr. Ellen Vitetta, director of the cancer immunobiology center at the University of Texas Southwestern Medical Center in Dallas. "The antibodies will provide another angle to hit the tumor cells." Still, for some patients, antibodies have clearly made a difference. "I used to cry the nights before I used to get chemo," said Betsy Patterson, a nurse in Spartanburg, S.C., who has non-Hodgkin's lymphoma. But Rituxan made the lymphoma disappear for now without the debilitating side effects like weakness, nausea and hair loss. "I feel better than I have for 10 years," she said.